Ex-Scorpions guitar virtuoso Uli Jon Roth is at it again with another solo project sure to excite his fans. 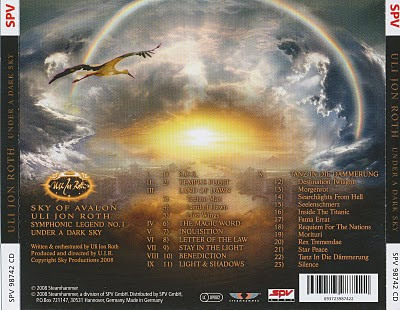 Uli Jon Roth’s “Under A Dark Sky” is a continuation from his acclaimed 1996 symphonic legends album “Sky of Avalon”. Additionally, Roth not only has a knack for music, but he also dabbles in painting, writing poetry, and even creating instruments. I could only imagine what amazing journey awaited me. Roth has become famous over the years for his great technical ability at performing some excellent neo-classical creations. He has been said to be the inspiration for countless guitar players across the world, and is even in Germany’s “Walk of Fame” in Gronau. This epic and ambitious piece of work surely is a testament to those wonderful accolades. When you begin to listen to this album it almost has an ominous feel to it. With the opening track named “S.O.S” you begin to wonder if maybe you should turn back, but realize that there is too much temptation to do so. A Martin Luther King pop culture reference seems to supply itself in the first track as well. Soaring orchestral and choir musings begin to awaken themselves and you really get a feel for what the entire album is going to be about. Throughout Roth is phenomenal in his own style, but you have to be ready for an avant-garde musical approach. In addition to Roth and all of his other musical elements Mark Boals, currently of Royal Hunt, and Liz Vandall, ex Sahara, lend their lead vocal talents. These two provide the impetus for the entire album seeming like two wondering spirits telling an elaborate story of humanity in a surreal world of possibility. Tracks like the epic three part “Land of Dawn” is an excellent example of these two working their magic. The last and greatest epic on the album “Tanz in Die Dammerung” brings the two singers to an even more incredible conclusion of musical majesty. “Under A Dark Sky” unfortunately has a real tendency to carry on pretentiously. Sometimes you wonder if you are listening to one long track only later to find out that you have listened to four tracks. Other times you wish that some of Roth’s musical themes were not so quickly abandoned from one track to the next because of how good they were. The last piece on this album, already mentioned before in Tanz in Die Dammerung, is excellent in its own right but can be difficult to listen to because of its grand scope, so if patience is not your thing you might want to steer clear.